This season, our new ECHAIN belt's handsome leather and expertly crafted details elevate even the most casual outfit. it's never been easier to cinch the perfect, pulled-together look. ✔Belt length 105cm suit for waistline 28"-30"
✔Belt length 110cm suit for waistline 31"-33"
✔Belt length 115cm suit for waistline 34"-36"
✔Belt length 120cm suit for waistline 37"-39"
Easy removable allows you to cut the belt to your ideal size to give a primmer and custom-tailored appearance, you can precisely adjust your belt to the perfect fit. 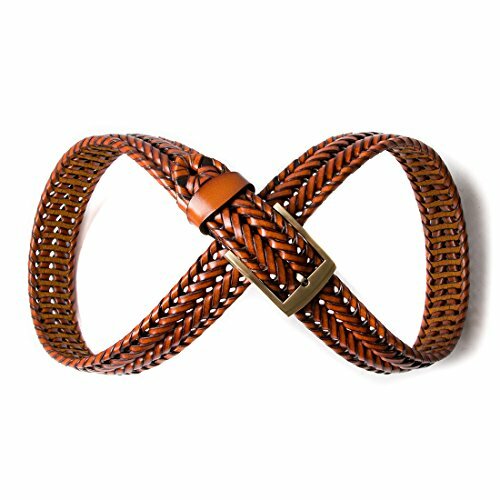 Woven belt with classic pin buckle, it is a perfect decoration to make a bright spot for pants. This Braided belt is made of high quality second layer cowhide leather, soft but durable enough. Pin Buckle Leather Belt for Men.Ideal for almost all gentlemen on any casual occasion, also would help liven up your outfit. If it slightly has a smell of leather, we advice to ventilate it for a while after you receiving it. If you have any questions about this product by ECHAIN, contact us by completing and submitting the form below. If you are looking for a specif part number, please include it with your message.